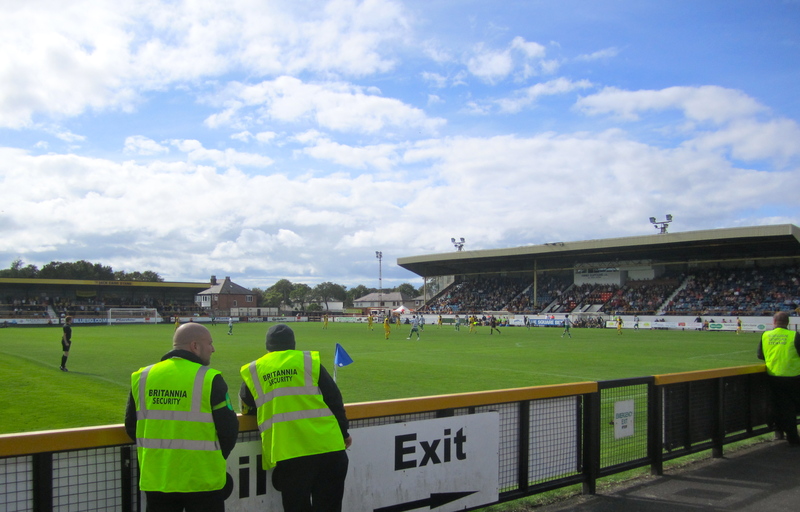 Unable to get a ticket for Anfield for Liverpool’s game versus Sunderland, Andy Walker headed up the coast for the first time in years to experience some Non League action at Southport. Normally I would be at Anfield for the first home game of the season, but I was unable to get a ticket due to yet more (and for me disastrous) changes to the ticketing arrangements for Liverpool. 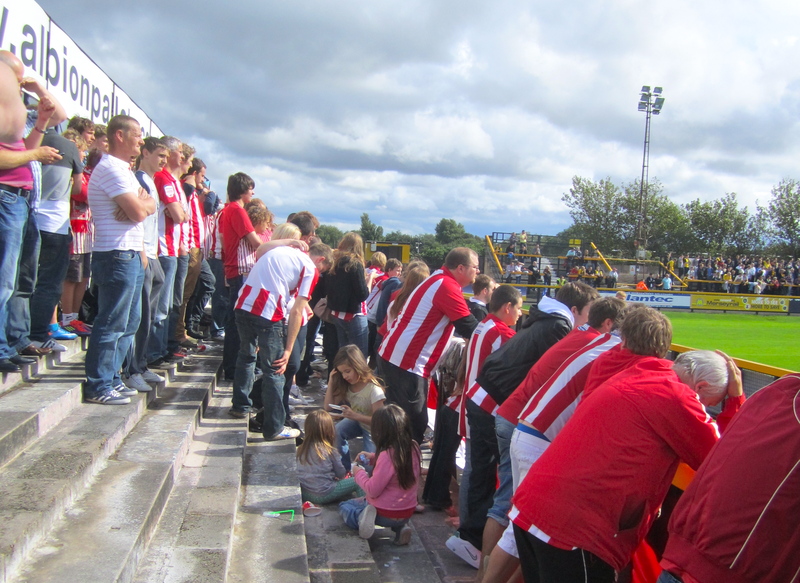 So for my first game of the 2011-12 season I went to a rather unlikely match for me – the Sandgrounders against the Imps. It probably seemed even more unlikely for both sets of the supporters and a game that the Southport fans must have been relieved to have. They were relegated from the Conference (I’m still using the old skool name) in May after a disastrous end of season run, but were then reprieved in June when Rushden & Diamonds were thrown out of the league and dissolved as a club due to financial issues. Lincoln also didn’t expect to be playing at Haig Avenue this season as they looked likely to stay up through most of the season then being sent down after suffering a horrendous run of nine defeats and one draw in the last ten games of the season. Now there is bad form and there’s Lincoln end of season form! The last time I went to see Southport was way back in 1984 at the final of the illustrious Dairycrest Lancashire Floodlit Cup, which was played at Deepdale on a plastic pitch. On that night they beat Horwich RMI 4-0 with a rather young hat-rick hero, one Andy Mutch (Sean Teale played in the same team). Time for another future Premier League star to show his head for the Sandgrounders? I took the Northern Line train from Fazakerley to Southport having arranged to meet my red haired cousin Helen – an Imps fan – at the nearest hostelry to the Haig Avenue ground. As I passed between Hall Road and Hightown needless to say I received a text offering me a ticket for the Liverpool game. I had time to turn around, but arrangements being made I stuck with my plan to see my cousin, the first Conference game of the season and no doubt have a few ales in the Victorian tourist resort – and town of my birth and later escape. After a quick Fullers ESB at the Baron’s Bar in the Scarisbrick Hotel, where my drinking life really began more years ago than I care to mention, I then hopped into a cab to the Thatch & Thistle. Helen and Mike were sat outside as the weather did it’s best to confuse with alternating battleship grey, scudding white clouds and even the odd bit of blue. A true English summers day for the start of the season at the seaside. Groups of happy supporters clad in the red and white of Lincoln were sat engaged in the traditional pre-season chit chat no doubt mixing the shock from the end of last season with the hope for this one. The reappearance of the Saturday away days predominantly painted the faces with smiles. After a nice pint of Moorhouse ‘Pride of Pendle’ we wandered the couple of hundred metres over to the Away end of Haig Avenue. Back when I went there was no away end, the fans used to stand at the end their team were shooting to then swop ends at half time. Twelve and half quid later and I was on the ten step terrace that makes up the Blowick End of the ground. I asked a relaxed looking steward about a programme “Sorry mate, sold out,” he shrugged and shook his head, “same as last year first game of the season. The idiots never learn.” “Never mind mate,” I said shaking my head, “I’m a Liverpool fan really.” “Same here,” he smiled. Shame, I’d have liked one with it being my first match here in twenty seven years. Back in the middle of the terrace the red and white stripes, were singing to welcome the green and white Imps out on to the pitch. Despite playing against the yellow and black of Southport the distinctive red and white Lincoln kit would have to wait for the home game, having separate sponsors for the away kit they always have to wear it away from home. Lincoln started kicking toward our stand but in the early exchanges Southport were the better team, to some consternation of those around me. But after 29mins Sam Smith scored against the run of play with a header from a set piece. The Imps fans were happy and sang like the away fans i.e. much louder than the home ones. The team too started to command the game and looked comfortable. It looked promising for them. There was a respectable 1687 attendance at the game. During quiet periods of the game as the 400 Lincoln fans relaxed songs about the team gave way to good natured banter with the identical twin stewards in front of the goal. Red haired and bearded you’d think they would be hidden away rather than put directly in front of the away fans. Asking for trouble really! The masochists seemed to enjoy the banter. A nice touch was the apt sponsor for the stewards – a Pest Control company. Just as Lincoln looked like they may have control a relatively innocuous challenge led to a free kick to Southport in the 41st minute. From twenty yards a lashing shot was driven by the squat figure of John Paul Kissock in to the top right corner of the Lincoln net, which Joe Anyon had no chance of saving. I clapped briefly until I realised which end I was stood, and I turned to Helen and shrugged. I found out later than Kissock was from Fazakerley and was let go from Everton at the end of the 2009 season at the age of 19. So at half time it was 1-1, probably about right. The stand looked empty as the red and white tops stood in a massive queue on the right for the hot dog and burger stand. I felt hungry but not enough to face the wait. In any case the queue to the left was almost as long for the Portacabin bogs and I had more need to redeposit my ESB and Pendle so I headed left. The Portacabin was surprisingly clean, and I dare say potentially better than the hot dog stand. Early in the second half Lincoln started the brighter, and after 50 minutes took the lead again with another goal from a corner, this time Kyle Perry the beneficiary of decent delivery and less than adequate defending. However the lead was short lived with Shaun Walley equalising with an ‘in of the post’ shot from just inside the box following an embarrassing series of defending mistakes and none challenges. As Southport made a substitute the “21” of Kissock went up and the Lincoln fans cheered as he jogged over to the touch line, only to be told that it was a mistake. The Lincoln fans shoulders fell as he stayed on. Apparently the Lincoln defence was a makeshift affair, and on this form it certainly needs much improvement if they are to bounce out of the Conference. Adam Watts playing in the right back in particular was given a torrid time, particularly by my Fazak mate. The game petered out really and finished 2-2. 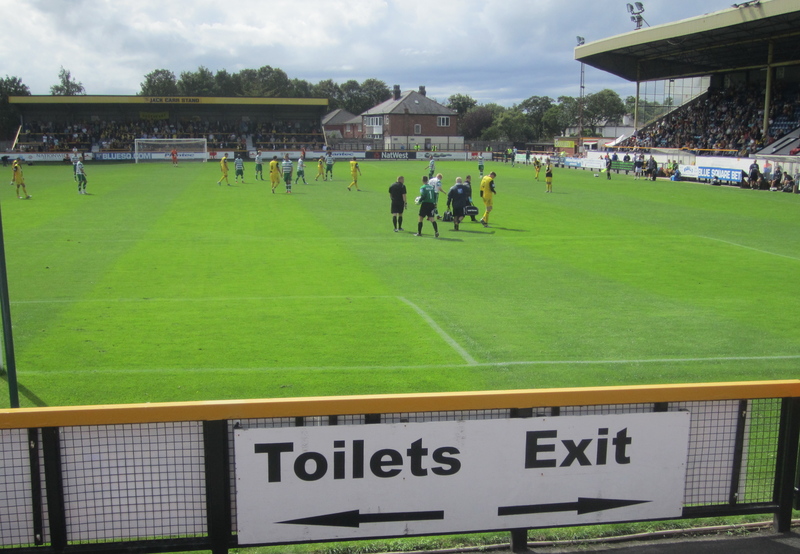 Southport would probably have been more happy with the point than Lincoln before the game, but they certainly deserved at least a share of the points. Some good attacking play from both sides gave all the fans something to be positive about whilst disecting the game over a pint, while the poor defending would surely be rectified by those soon to be returning players. Surely. It was then time to catch a train from Meols Cop to Southport for a few choice beverages in Southport hostelries. In truth not really any choice beverages and pretty average pubs. In summary: not a bad game, good company, pretty poor beer in average pubs, no attractive blondes unlike my last write up for European Football Weekends and rather too many red-heads????. Overall: a good day and maybe I shouldn’t leave it for 27 years until I see Southport again. You can follow Andy on Twitter here.